A great time to give you a quick roundup on the Glitzkoin project, GTN token and of course the DiaEx diamond trading platform. No sales hype here, just the bare facts about the journey that we have embarked on. And if you are just getting to know about Glitzkoin, the paragraph at the end of this report should give you a clear picture of the Glitzkoin Mission. •	Glitzkoin successfully completed an ICO that ran from, March to June 2018. •	The GTN token was priced in the $0.15 to $0.20 during the ICO. It garnered wide support from knowledgeable crypto enthusiasts. •	Since the Glitzkoin diamond blockchain project is based on the Stellar blockchain, the token was listed on Stellarport in July 2018. •	Just to recap, most cryptos launched during that period crashed, well below their ICO value within weeks of being traded. •	With continued support from seasoned crypto traders, the GTN token hovered effortlessly around its ICO value, trading in the $0.18 to $0.22 range. •	This was the price range until October 2018 and then, came the one of the most turbulent times experienced by crypto markets. Crypto stalwarts like Bitcoin and ETH tumbled, losing as much as 50% to 60% of their value. •	November and December 2018, were terrible months for cryptos but, the Glitzkoin GTN token went against the tide and put up an impressive show. •	As crypto sellers liquidated their holdings, they seemed to be impressed with the comprehensive and thorough, project plan pesented by Glitzkoin. •	GTN activity on the Stellarport exchange surged, the token touched the $0.30 mark for the first time since its launch. This was a hefty 50% price appreciation when, compared to its ICO closing price of $0.20. •	Jun 2018 – Completion of Glitzkoin ICO. •	Jul 2018 - GTN listed on Stellarport exchange. •	Sep 2018 – Launch of Diamond Price Estimator. •	Oct 2018 - GTN trades at around $0.22. •	Nov 2018 - GTN price surges to $0.30. •	Dec 2018 - GTN maintains $0.30 price level. •	Jan 2019 - Glitzkoin – Myticket.asia Partnership. •	Feb 2019 - GTN trades in the $0.30 to $0.34 range. •	Mar 2019 - Negotiation for DOBITRADE listing, completed. •	Mar 2019 – GTN maintains its $0.30+ price level. Notes: Stellarport is a crypto exchange dedicated to cryptos, launched on the Stellar blockchain. The Diamond Price Estimator, helps evaluate the price of a diamond based on its 4C parameters. The algorithm also considers the global demand and supply, for the glittering stone. The agreement between Glitzkoin and Myticket.asia, allows visitors to the ticketing portal to pay for their purchases using the GTN token. The DiaEx diamond trading platform has passed the testing phase. Work is on to integrate the payment module into the platform. The process of listing the GTN token on the DOBITRADE crypto exchange, has been completed. The token will be traded on DOBITRADE, in the month of April 2019. Glitzkoin Mission: For those of you who are not yet familiar with the Glitzkoin diamond blockchain project, here is a brief explanation. Glitzkoin is focused on improving, productivity and market scope for the multibillion dollar diamond industry. The projects includes a comprehensive diamond exchange DiaEx. Diamond traders irrespective of their size or location, can operate directly on the trading platform. Payments on the DiaEx platform are settled using the GTN token. Promoted by diamond veteran Navneet Goenka, Glitzkoin is the first substantial effort being made to improve the glittering industry. With a strong passion for the latest technologies, CEO Navneet Goenka is also involved in bridging the gap between tech and business. Negotiations to increase the usage of the GTN token are at an advanced stage. A January 2019 agreement between Glitzkoin and online ticketing giant Myticket.asia, makes the GTN token an official payment option on the portal. 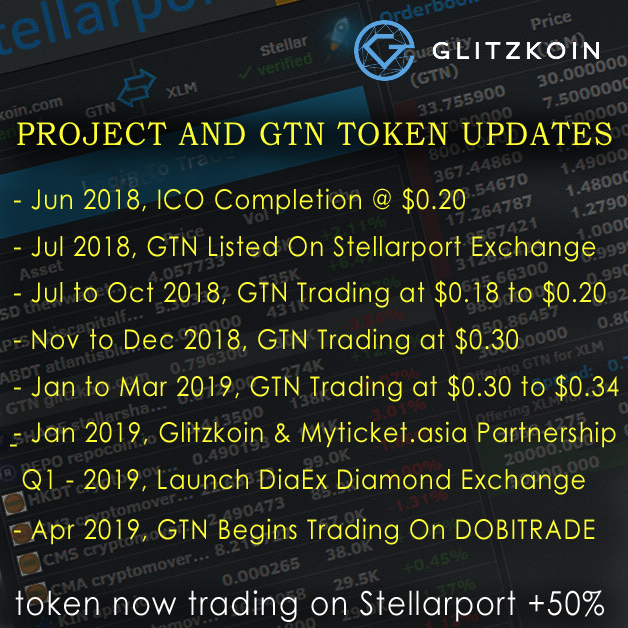 The GTN was listed on the Stellarport crypto token in July 2018 shortly after, the successful completion of the Glitzkoin ICO. A March 2019 announcement confirmed that, an arrangement to list the GTN token on the DOBITRADE exchange had been finalized. The backend technical process to implement this, would be completed by mid April 2019. As a crypto exchange, DOBITRADE has a trader base and volume that is significantly larger than Stellarport. The management expects to ink exchange listing agreements, with a few more exchanges within 2019.